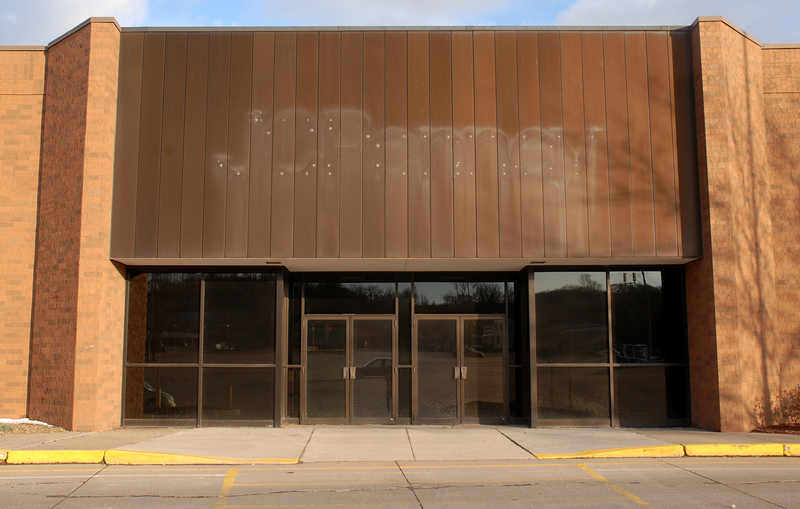 The demise of JCPenney is part of a larger phenomenon that has grim reaper analysts announcing the “death of retail.” With Amazon and other online shopping outlets offering a greater selection of goods than ever before, customers no longer need the bundled convenience of department stores and shopping malls. A forecast from Credit Suisse predicts that by the end of 2017, 8600 stores will close, and by 2022, 25% of American shopping malls will no longer exist. As of March the report seemed to be on track, with 3571 closures announced. JC Penney sits in the troubled company of its competitors, including Sears, Macy's, Dillard's and Nordstrom, who are all downsizing. In May 2016, 6,000 in-store retail jobs were lost. 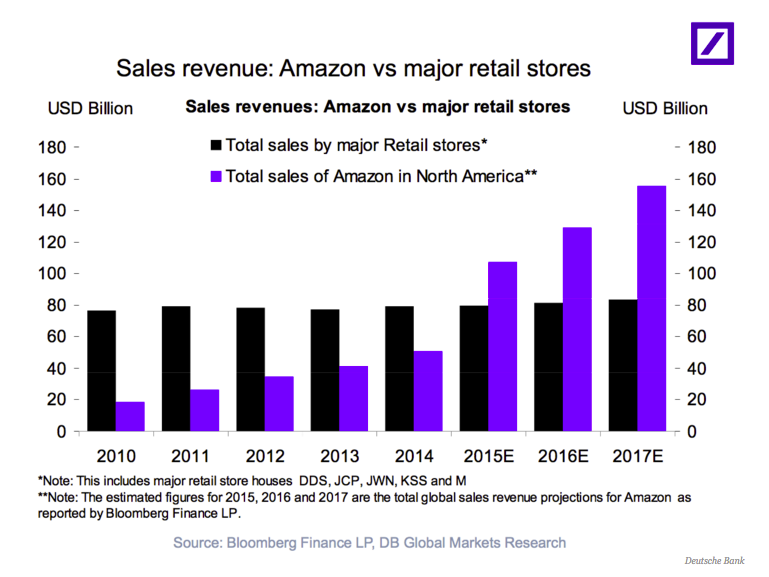 On the other hand, Amazon is seeing enormous growth. In 2015, Amazon announced $82.7 billion in sales, compared with Walmart's $12.5 billion. Amazon has quite literally eaten other retailers with acquisitions of Whole Foods and Zappos. In an incredible statistic, half of U.S. households have Amazon Prime subscriptions. Industry standards are being reset in Amazon's image. In order to survive, retail brands have to offer free shipping and returns, lower price points, instant checkout and delivery everywhere. Consumer preferences don't indicate that Amazon should be the only shopping option on the planet, however. Buyers still want the personal care and attention that specialty shops offer and the prices that big, efficient businesses do. They want to identify with brands. And finally, they want the shopping experience to be stress-free. The changes in shopping are only making the retail industry more democratic, competitive, and crowded than ever. 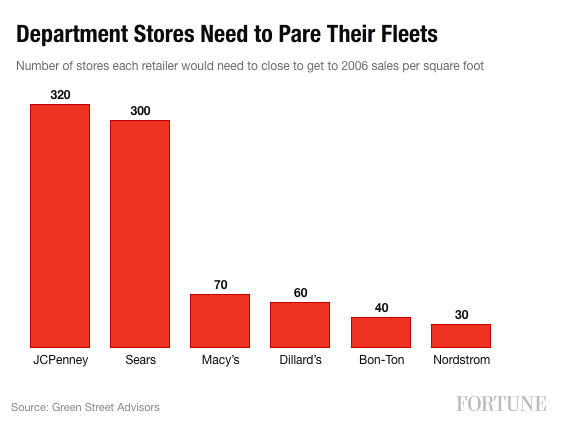 Yes, the so-called “death of retail” is a misnomer. In fact, where JC Penney reported its worst holiday season ever in 2016, the overall sector saw the best numbers in recent history. So without further ado, let's look at some of the downright Darwinian adaptations companies have made to stay alive in the face of doom, gloom, and Jeff Bezos. Invest in famous influencers - PacSun has partnered with Kendall & Kylie Jenner since 2012 on a clothing line, which they promote heavily on Instagram. Started a multi-dimensional hashtag - #mygsom stands for “My golden state of mind” and centers around the theme of California cool. The tag has amassed over 206k Instagram posts of surfers, skateboards, sun-drenched afternoons, music festivals, palm trees and mountains from users around the world. The company also launched a content-rich site around the tag, complete with a contest to win a trip, and a rewards program for buyers of PacSun goods. At first glance, it seems Fabletics is reverse-engineering the death of retail by turning its online business into brick-and-mortar shops. Kate Hudson's subscription-based athleisure brand charges consumers $49.99 monthly for discount athletic apparel. They recently opened 22 stores with the aim of providing shoppers with what e-commerce cannot: the ability to try before they buy, and an opportunity to bump into other shoppers who embody the fit lifestyle they aspire to. Syncing online with reality - "We want to completely mirror the stores to the online experience," parent company JustFab CEO Adam Goldenberg told Forbes. He also mentioned that 40% percent of Fabletics’ in-store purchases have been made by online shoppers who wanted to try things on in person. If they're not ready to purchase, or something's out of stock, customers are able to record what they liked about a product and access that information from the Fabletics site or app anytime. Selling subscriptions in person - Fabletics store employees are encouraged to recruit shoppers to the online VIP program, making the most out of face-to-face conversations. Compare and contrast - Fabletics positions stores next to its more famous (and more expensive) competitors, Lululemon and Athleta, making the association between the brands more apparent. 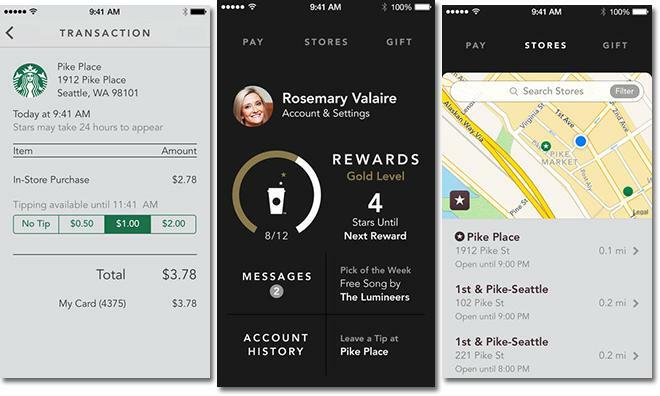 Digital pay - Loyalty members get a physical debit card that they can add money to, but a digital version is included in the Starbucks app, so customers don't have to take out their wallet to pay. 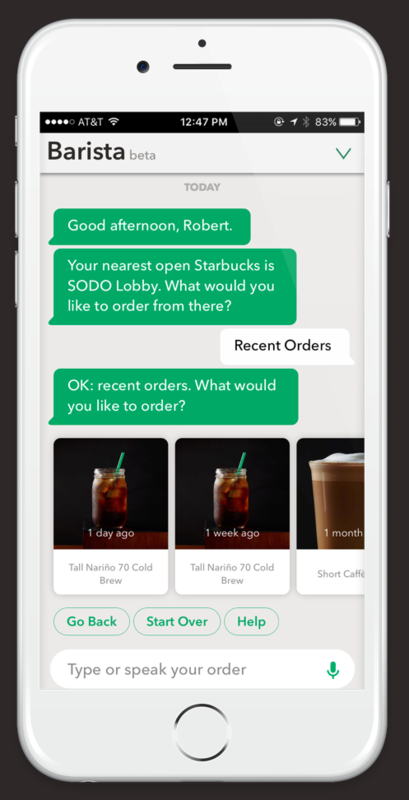 From the app, they can also place orders to pick up in-store. 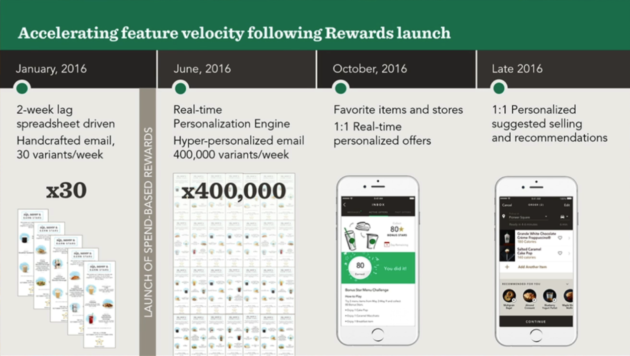 Gamification - Starbucks Rewards is based on a gratifying system of stars that you earn for every purchase and referral made. When you reach gold member status, you know you've made it. It's addictive and fun. 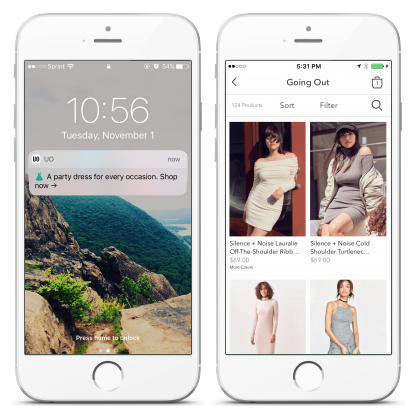 Personalized promotions via AI - The company recently announced an artificial-intelligence backed suggestion tool that would make real-time offers to loyalty customers based on spending habits and purchase history. “[N]ow, if we would like you to attach a food to your favorite drink, we present to you foods you are likely to select, or that you’ve selected before,” CTO Gerri Martin-Flickinger said. Despite being the most ubiquitous coffee shop on the planet, nothing about the Starbucks user experience is impersonal. Even if the artisanal place next door roasts their own beans and bakes their own croissants, Starbucks offers the advantage of having your favorite drink waiting for you, prepared just the way you like it. Returning feels like home, especially when drinks are on the house. H&M still gets most sales out of its physically imposing stores, but the mega-retailer might as well be galaxies away from the suburban mall. One source of continuous new business for the Stockholm-based corporation is collaboration with avant-garde fashion designers. H&M has done one collaboration per year since 2004, starting with Karl Lagerfeld. The high brow touch applied to cheap items makes for an irresistible mix for young shoppers who want to be known for good taste. Cutting edge content - For its latest collaboration with industry darling Erdem, H&M released an elaborate promo video directed by Baz Luhrmann, of Great Gatsby and Moulin Rouge fame. Figuring in fans - H&M's most commercially successful collaboration was with Olivier Rousteing of Balmain. 29-year-old Rousteing is hugely active on Instagram, known for responding to comments from fans, and posting photos with celebrity friends. He has amassed 1.4 million followers as a result. H&M doesn't release sales figures on its collaborations, but on launch day of H&M x Balmain, its website crashed and brawls broke out. “Surprise factor” - The designers H&M picks encompass diverse visions, personalities, and price points. The same shoppers are not necessarily drawn to each collection. “We always want to give the customer something they wouldn’t really expect,” Donald Schneider, creative consultant to H&M says, which explains why the uber-glamorous Balmain followed the downtown cool of Alexander Wang. By collaborating with talented designers, H&M distances itself from its mass-market category, and aligns itself with the values of urban culture mavens. The designer collaborations appeal to the customer who loves to go to art galleries but can't yet afford to buy a painting for his apartment. Taste, which is often just another synonym for wealth, becomes accessible through these collaborations, breaking through to the core of how customers want to present themselves and be seen by their peers. There's no right way to do personalized shopping, and each of these brands have had to develop stronger company identities in order to appeal to customers who are motivated and inspired by authenticity. It's a step in the right direction, away from a boxy anonymity and towards an adaptable humanity. Building a strong retail brand in the digital age takes guts, and success requires a willingness to grow and change without giving in completely to zeitgeisty gimmicks. By paying close attention to the kind of interactions customers prefer, retail companies are trading in a one-size-that-doesn't-really-fit-all mentality to a size that fits you, which is a change everyone can get behind.